We’re stoked to be premiering the new album from garage-psych locals Easy Browns today, and oh boy, it’s a doozy - careening and unpredictable from start to finish, Trash! is a gloriously wild ride and a huge return from these loveable weirdos. Back in 2015, Easy Browns Truckstop Chicken Jam Band rolled onto the local scene, and immediately got to work blowing audiences away with their wild psych-rock and infectious live show. The next few years saw them carry on in a similar fashion, releasing their debut album Evil! in 2017 and a handful of other bits and pieces along the way. More recently however, things shifted with a lineup switch and a few words hacked off the end of their name, all leading towards the release of album #2 today. But as frontman Zak Brown sings “I ain’t got time for fluffing around” on ’Thyme’, it’s clear that Trash! finds Easy Brown at their most refined yet, as they hone in and nail their idiosyncratic sound while maintaining the charming chaos. Kicking things off is the album’s first single ‘Mammal Love’, which instantly sets the mood with bouncing grooves, lopsided guitars and lively flutes, all tied together by Zak’s gooey yelp, and with a refrain of “rock n roll seems to be all that I know now”, it plays out as the only natural starting point. Next up is ‘Thyme’ which drags us into the madder side of their universe with a signature Easy Browns’ grin, full with erratic guitar-interplay and propulsive drums, before it drifts into an eerie faux-jazz jam, and ‘Jigglin Back’ keeps the manic vibes strong with every shapeshifting vocal and unexpected timing shift. It’s not all fun and games though. ‘Chippy Packet Respirator’ finds Zak demanding “why did we cut down all the trees?” from behind a wall of volatile guitars and pounding beats, and ‘Junk’ is Easy Browns at their most dangerous yet, as filthy guitars dart around snarling vocals. But where Easy Brown’s shine brightest is when they’re at their most playful, where it’s impossible to deny their charm. Full with chicken-pickin guitars and a joyous groove, ’Easy Browns Truckstop Chicken Band’ might be a joke if it weren’t so damn catchy, and album highlight ‘Slipped’ is just the band having fun, as they give a 60’s pop tune the full EZB treatment and shoot it to hell and back. Wrapping things up is ‘Goodbye Blue Monday’, a chaotic closing track that somehow manages to tie all of Trash!’s different personalities into one final blast of noise - from evil to groovy to berserk to childish - while still making complete sense. It’s a fitting way to sum up the entire album though - from the opening guitar warble through to its final grooves, Trash! is an incredibly wacky journey through a world of colour and mayhem with Easy Browns at the wheel, but as they take each unexpected turn with remarkable ease and contagious energy, all that’s left to wonder is where these oddballs will steer us next. 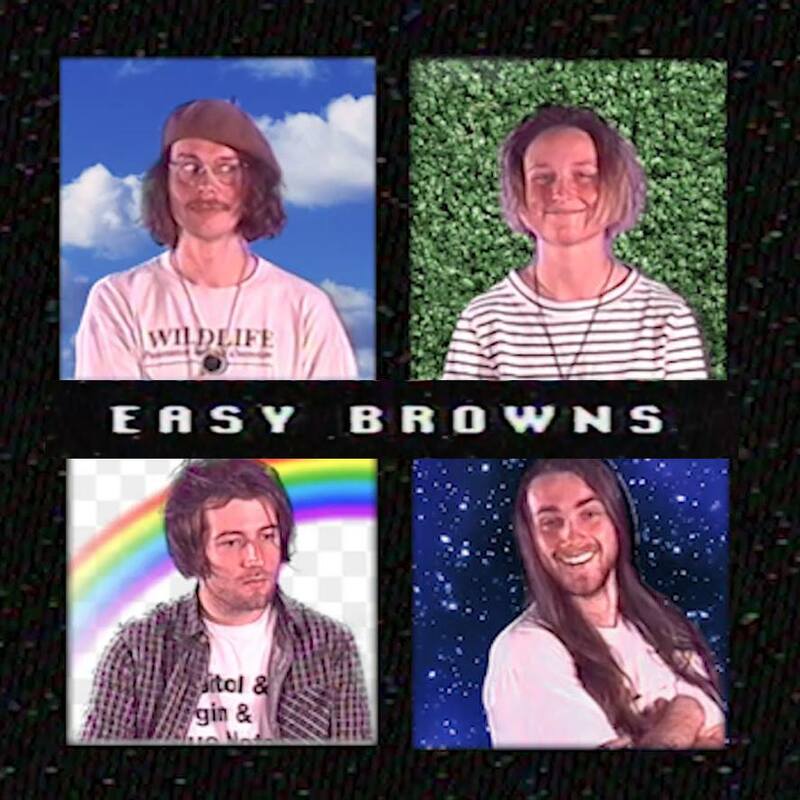 This Friday, Easy Browns are launching the new album with the Codeine Cowboys and FOX at a secret location in Collingwood, and ahead of the show we got in touch with mastermind Zak Brown to find out a little more about Trash! TJ: G’day Zak, bit of a hard job missing you and the crew around town so I don’t really know who needs the context, but anyway, what’s the story? EB: Well i started Easy Browns in 2015, after moving up to the Big-M to pursue music. Unfortunately the youth music scene where I grew up (Morwell, right next to Halewood Power Station and the Latrobe Valley open-cut coal mine) wasn’t doing so well, there was nowhere really to play except at Freeza gigs (Freeza rules!,) and the local Tafe's Cert IV in music course got cut - goes to show where the priorities are for regional Victorians. This is also why we love getting out into regional areas and throwing down some fat grooves haha. Your second album is out today. Wanna tell us what Trash! is all about? Like a lot of the lyrics I write, Trash! is very environmentally and socially focused, as you may be able to tell from the title haha. Life's just one big social experiment, go out and be a whack job! It’s a pretty fun record though, Easy Browns are pretty much a family, we spend all of our time together and express our love for each other freely, that tightness has us all on the same page groove wise too, I couldn’t ask for a better group of friends and bandmates. Shelby, Liam and Brodie, luv y’all big time! This time around the band has a new name and lineup, and the result is perhaps your most concise release yet - can you explain much about what was happening around the time it came together? Well I’d just gotten back from two months in Nepal and had put together a classic Tote front bar residency to get the band steamrolling on again, we smashed that out and figured it was about time to get started on our second record and we got to tracking with Fabian Hunter at Cookmans Cove. Most of it was written pre-tote-reso, the only things that weren’t complete yet were Mammal Love and Thyme, the first two tracks funnily enough HAHHAHAHA yeah whatever! But by this point things were hot and rolling, we’d smashed out a Gizzfest hut stage set the year before and we were picking up a bit of steam, it’s been a long road to get to this point that’s for sure, I wouldn’t have it any other way, I’ve definitely needed the time to refine my writing style! You’re launching Trash! at everyone’s favourite mystery location this Friday. Any idea what to expect from the night? Aw just a bunch of lovely weirdo’s doing their thing really! Tight grooves and tight hugs if you’re that way inclined haha, we’ll also scheme up some weird art for the night, we love making each gig a special thing. We’re gonna play a huge set, and we’ve got our mates from way back home The Codeine Cowboys supporting, as well as an incredible new band called FOX playing too, some seriously amazing tunes and cool people. Make sure you hit us up if you want the address! How’s the rest of 2019 looking for Easy Browns? Hot to trot that’s for sure, we’re going to try get another record out by the end of the year, as well as some singles throughout. Really keen to do a tour or something though, I think we’re gonna tee one up with our mates in Hannah Kate so that could be a vibe! We also just got back from playing Lutruwita (Tasmania) Marion Bay Falls fest and doing a sick post-falls tour, (what a bunch of lovely cats down that way) was so nice and just keen to keep travelling with my best mates (the band lol fkn mushy right). Have a listen to Trash! above and head to easybrownstruckstopchickenjamband.bandcamp.com to grab a 12" LP on limited yellow vinyl, and you can catch Easy Browns this Friday, January 18th, as they launch the album at a mystery location.